I began my Karate training in March of the year of 1990, in Okinawa under the direction of Grand Master Kise at the Gunners Gym on U.S. Marine Corps Base Camp Foster. All of my training has been in Okinawa. I received my Shodan on 1 March 1992 and and reached Rokudan in 2009. I have been the direct student of Grand Master Kise the entire time, and a student of Kaicho Isao Kise since 1992. Becoming more active under him since receiving my Nidan certification. All of my certification tests have been in the Hombu Dojo in Okinawa City. 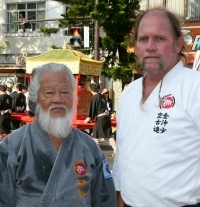 Grand Master Kise and Kaicho Isao Kise have been present at every one of my tests. I have had the privilege of assisting Grand Master Kise at the Gunners Gym Dojo since about 1997 with the youth classes. In 1999 I became president of the Okinawa Kenshin Kan Black Belts Association. While in Okinawa I have had many opportunities to participate in local events with the Kenshin Kan. Including the Grand Opening Ceremonies of Shuri Castle after it was remade to it’s original glory. Many parades, weddings, birthdays, book parties, anniversaries, annual demonstrations at various civic halls, and festivals.